For over 30 years, a U.S. Corporation providing expertise and quality solutions for critical applications. Daitron Incorporated exists to fill the needs of customers spanning diverse industries and product requirements worldwide. Daitron has evolved throughout the years in response to our customers’ requirements by adding to our core lines of products and services. Our business divisions serve a broad range of industries including semiconductor, solar cell, electronics, heavy-duty industrial, transportation, medical and biomedical, and several others. We distribute electronic components, power supply equipment, optical and image processing equipment and components, power supply products, and much more. Our offerings also include ESD and anti-static products that protect sensitive electronic components from electrostatic discharge during the manufacturing, assembly and packaging processes. We are dedicated to consistently providing the very best customer service and competitive pricing in a global marketplace. Please use our website as a window into our products and services and contact us so we can work together to fulfill your equipment, component, or consumable needs. Daitron operates under several divisions to deliver a diverse offering of high-quality products and services to our customers. We have experience working with a diverse range of industries and can help you find the right products for your application. Contact us to learn more about our broad offering of Daitron equipment and components. Our capital equipment offerings for semiconductor applications including wafer handling and processing equipment, LD/LED processing equipment, wafer shipping materials, and ESD control and anti-static products. We also provide capital equipment services and repair performed by certified product engineers. We stock and distribute electronics components including microwave and radar products, semiconductor and board level components, AC/DC power supplies, electric double layer capacitors, and batteries. 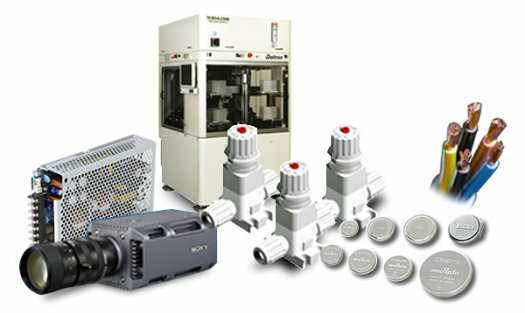 Our line of electronics products also includes sensors and other industrial automation equipment. With a worldwide network of manufacturers, we can help you find the right industrial power supply equipment for your application. Fluid process components are used in numerous applications including biomedical, data storage, semiconductor manufacturing and more. We offer several liquid process system products for flow control, liquid temperature control, liquid flow monitoring, and wet sonic cleaning. We also carry liquid chemical analyzers and high purity tube fittings for wet process applications. Visual imaging equipment is widely used in medical, security, presentation and distance learning applications. We stock and distribute machine vision inspection equipment and components including cameras, medial and machine vision equipment, frame grabbers, printers, LCD video monitor displays, and laser and fiber-optic measurement systems. The Value Added Assembly Division at Daitron power supply provides custom cable components and assemblies for commercial and industrial applications. Examples include wire and cable for commercial rail transportation, electronic component assemblies, control panels, and much more. We also provide custom kitting services. Daitron offers equipment, products and services for fluid applications, semiconductor manufacturing and much more. Contact us today to learn more about our product offerings and to discuss your equipment and component needs.